Incredibly: With built-in digital effect! And at this price! 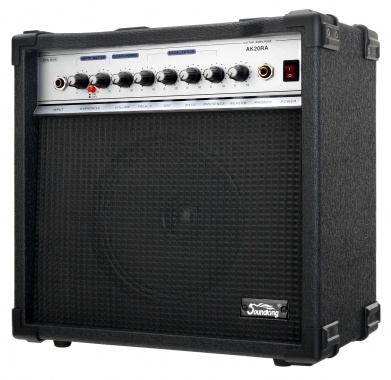 Other amps in this price range usually only have an analog reverb! 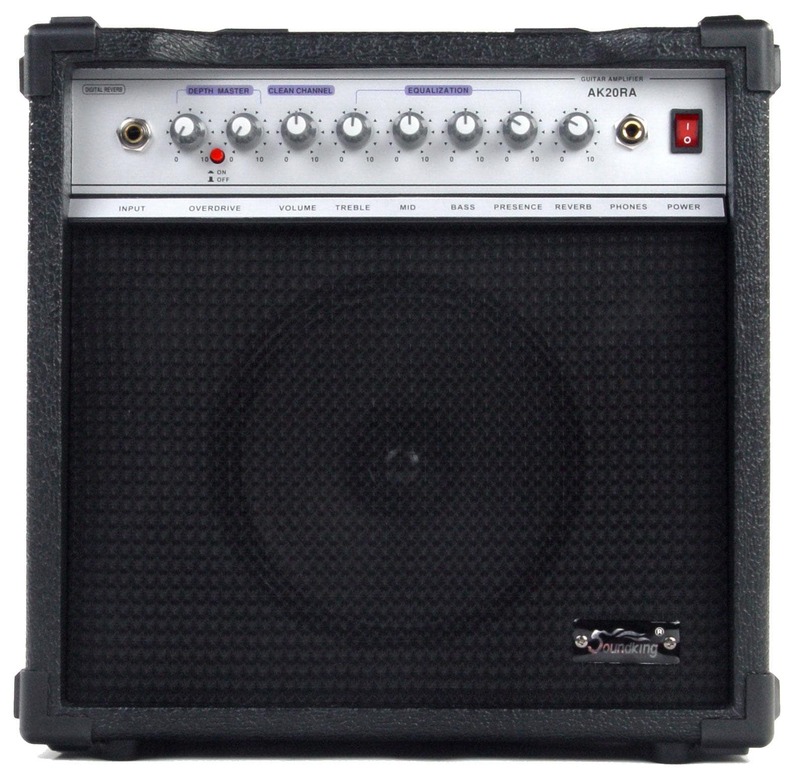 With the Sound King AK20 you receive the perfect guitar combo for effective practicing at home or in the backstage area before the next gig. 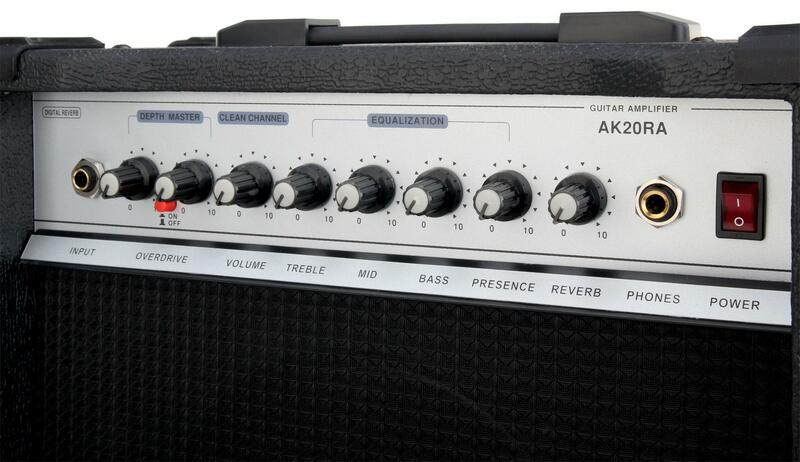 But of course the AK20 is also a practical and flexible second amp for rehearsal rooms. 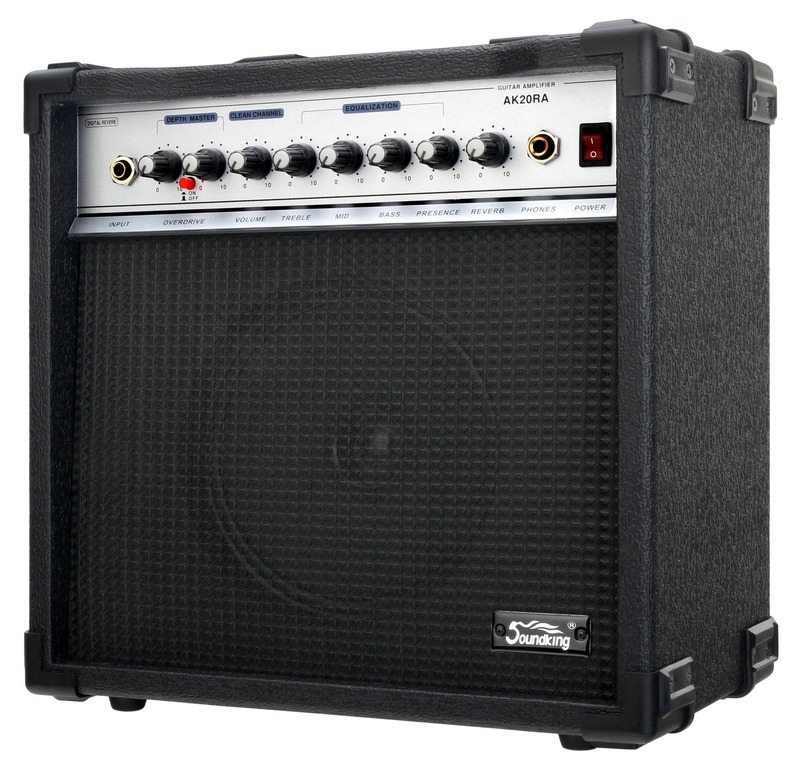 Small gigs and sessions are absolutely no problem for the AK20, as the 20-watt combo produces incredibly high sound levels and has a very powerful resonance. Comprehensive but intuitive settings guarantee maximum flexibility and maximum fun! Two channels (clean and overdrive) deliver sounds that really punch through for an amplifier of this compact size. The clean channel produces rich, clear guitar sounds that can be adjusted with the 4-band equalizer to your sound settings. The channel (distortion) provides everything needed: It has a separate volume control (master) and the depth control (gain) that can determine the amount of distortion. The four sliders of the equalizer are available here also. A highlight of the AK20 RA is the built-in digital reverb / delay, that producs the desired effect, including a space echo. With only one knob, you can quickly and easily create a three-dimensional and highly effective sound and mix the original sound continously. Another bonus is the integrated sound effects loop of Sound King combos. 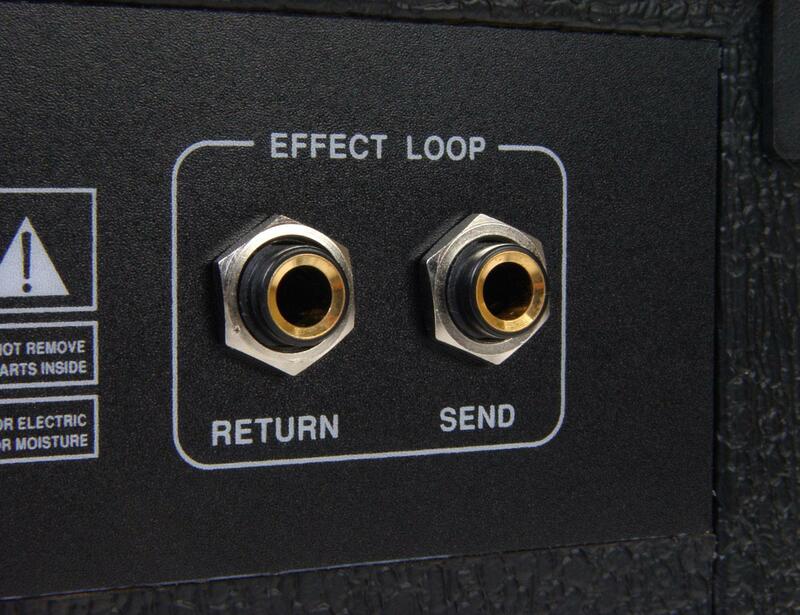 Effect devices can be combined smoothly through it. A valuable feature that in this price range is rarely found. Here, the word "Flexibility" is written with capitals! Mit dem Verstärker hat man Alles an Bord was man erstmal so zum Gitarre spielen braucht.Einen Clearchannel und einen Overdrivechannel.Der läßt sich über einen weiten Bereich regeln und hat einen guten Grundsound.So soll sich E-Gitarre anhören. Den individuellen Rest kann man mit Bass,Mitten,Höhen sowie Presence Regler einstellen.Dazu kommt dann noch Hall.Also schon mal recht viele Möglichkeiten der Klangbeeinflussung. Für die denen das nicht reicht gibt es ja noch unzählige Efektgeräte im Handel,die sich wenn man möchte über einen extra Effektweg anschließen lassen. Und soll es mal ein bisschen akustischer und reiner klingen ist da ja der oben erwähnte Clear-Kanal. Vom Sound ist das Gerät auf jeden Fall ok und bei der Lautstärke braucht man sich definitiv als "Privatanwender" keine Sorgen machen.Man kann auch ruhig mit ein paar Freunden zusammenspielen,Leistung und Lautstärke sind genug da für private Jamsessions. Also bei dem gebotenen Preis/Leistungsverhältnis hat dieser Verstärker meine wärmste Empfehlung! Genau das, was ich wollte. Genug Power, ein Effektgerät kann man auch noch einschleifen, sehr robust und das zu einem maroden Preis. Hammer!!! Generell wäre es mit einem Adapter möglich. 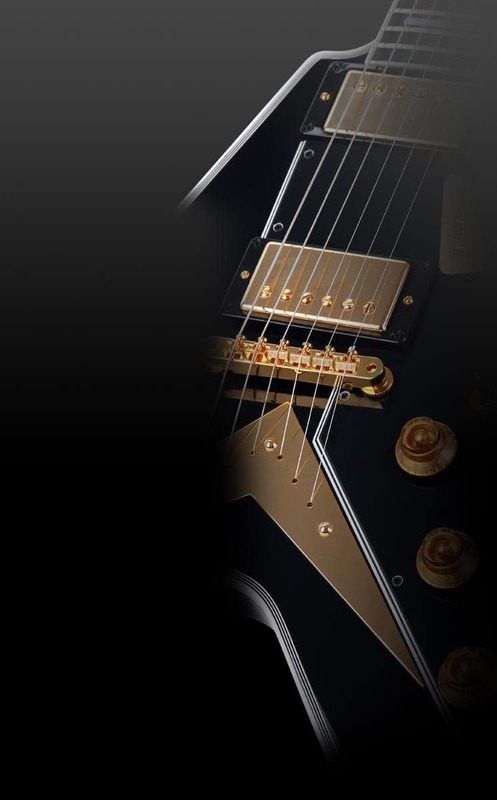 Allerdings wäre das Klangbild nicht ideal, da dieser Verstärker für E-Gitarren gedacht ist.